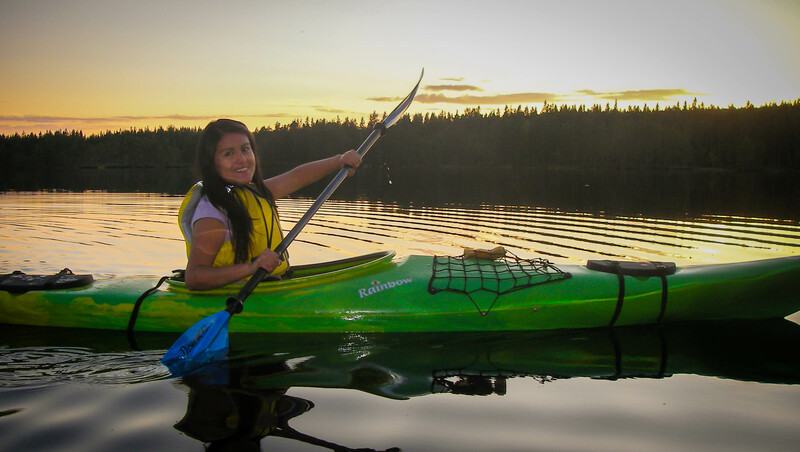 Kayak rental in Sweden - Rent of sea kayaks in the kayaking paradise, the Malingsbo-Kloten Nature Reserve, 2,5 hours drive from the Swedish capital Stockholm. 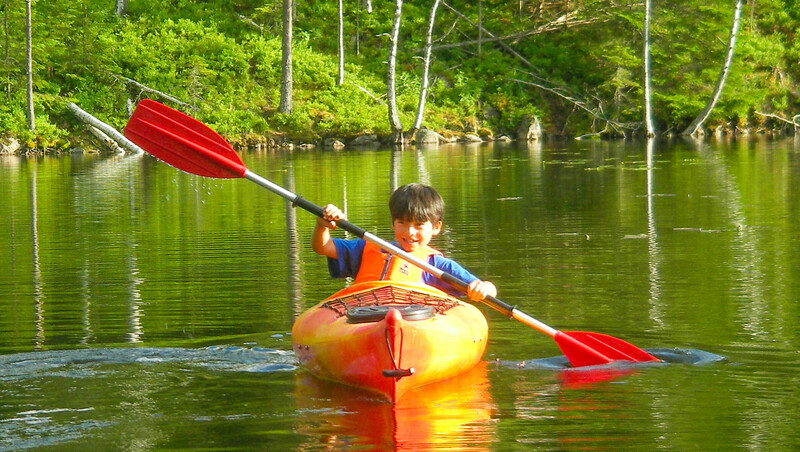 The kayaks are made out of the modern, strong, hard, plastic material, polyethylene. There are 20 single kayaks and 4 double kayaks in the fleet. The kayaks are transported in Västmanland and the south of Dalarna on bookings. The fleet also contains 40 canoes. The kayaks at the kayak rental are stable sea kayaks with broad waist constructed to manage big waves and strong winds in sea conditions. 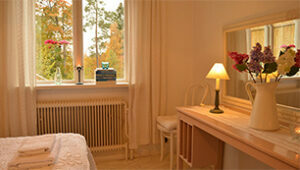 "We are very selective when we choosing equipment. The priority was to find a kayak which everyone could paddle. I am 194 cm tall and cannot enter the cockpit in approximately 70 % of the kayak brands on the market. The kayak should even be able fit a tall person who has also put on many extra kilos. So far we have not had a customer who hasn't been able to enter the cockpit on our single and double kayaks. 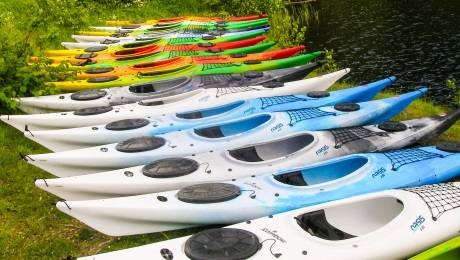 We are very satisfied with the selected brands of kayaks." One client 194 cm in height and130 kg in weight has been kayaking three days with additional camping equipment, food etc. It worked out well, but people weighing over 130 kilograms will have trouble getting in and out of the kayaks. The kayaks are made out of polyethylene and have 2 waterproof containers. The hull is round to flat with sharp bow and stern which give a very direction steady kayak. The packing volume is sufficient for excursions lasting several days. The water-proof containers have a 105 litre capacity. As a reference point it is equal to a big hiking backpack. The cockpit area holds approximately 60 litre more. In the cockpit, it is recommended to pack in water-proof sacks (available for rent). Equipped with soft back support, fixed foot supports (which cater to a variety of leg lengths) and net on the bow. 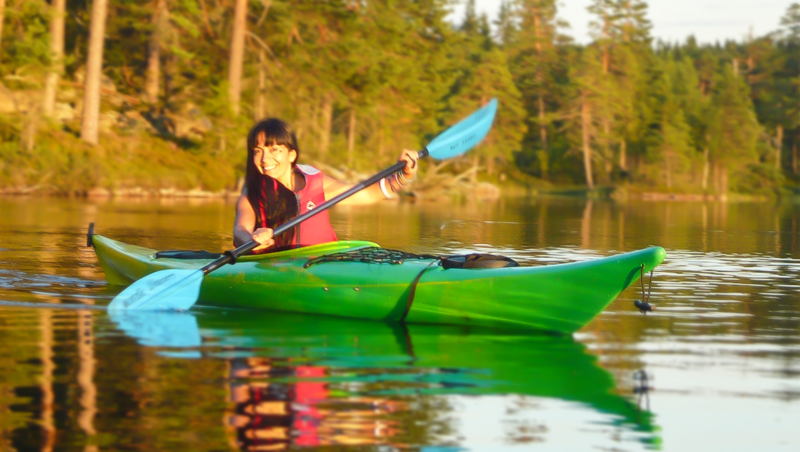 350 SEK/kayak /day in the Malingsbo-Kloten Nature Reserve. 2100 SEK/kayak/week in the Malingsbo-Kloten Nature Reserve. A very direction steady, high-quality double kayak. 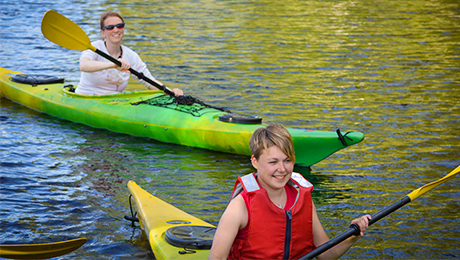 The double kayak is recommended for couples when one person feels uncomfortable about kayaking on their own, and for families when the children are too young to paddle in their own kayak. 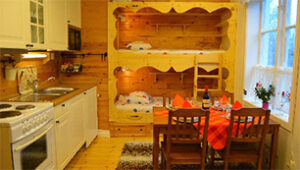 In both cases, the double kayak offers the perfect way to do something active together on the same terms. In this way, both paddlers get a good excursion where the potential irritation caused by waiting is avoided. 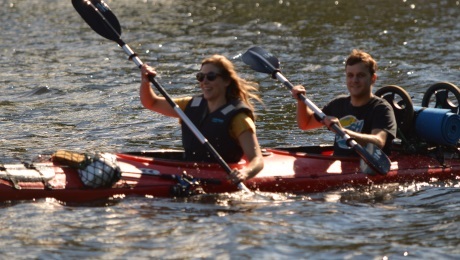 Instead, double kayaking is something you really do together. 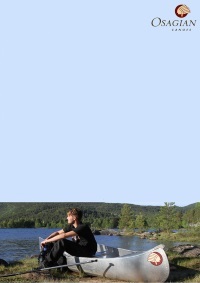 A recommended alternative for a successful introduction to kayaking and excursions in the nature. 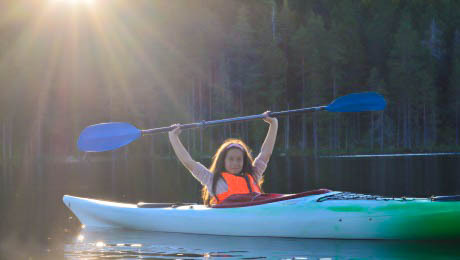 We have seen many examples of skeptic paddlers who have been introduced to kayaking successfully with the help of a double kayak. Something which has resulted in an interest in kayaking, happiness and a stronger relationship. The kayaks are made out of polyethylene with 2 waterproof containers and one smaller compartment for valuables. The packing volume is sufficient for excursions lasting several days. The hull is round to flat. Equipped with soft back support, foot support and net on the bow. 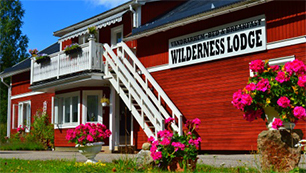 700 SEK/kayak /day in the Malingsbo-Kloten Nature Reserve. 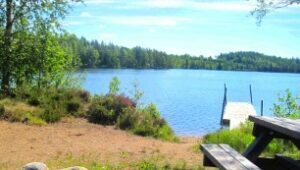 4200 SEK/canoe and kayak/week in the Malingsbo-Kloten Nature Reserve. Life jackets, paddles (child paddles for the children), spray covers, kayak trolleys and canoe trail descriptions with maps are included with kayak rental. 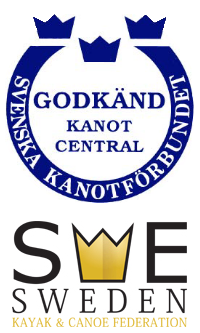 The equipment, which dated from 2016-2010 is of good quality and in good shape. 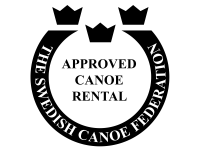 accordance with the Swedish National Canoe Association's standards. "You can feel secure if you contact a certified Canoe & Kayak Center, then you know that the safety and the information is taken care of according to certain standards"
How to pack a kayak? How steady is a sea kayak? Some people are unwarrantedly skeptic about kayak paddling. The bad reputation comes from a time before sea kayaks turned up on the market. Before, only competition kayaks existed, and these kayaks which are constructed in a completely different way to the sea kayaks. 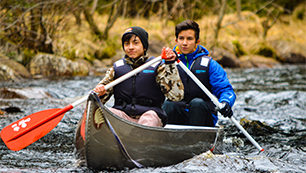 A competition kayak is constructed to be as fast as possible, with as little resistance as possible: therefore, the waist is extremely narrow and it has very poor stability. The sea kayak offers the opposite qualities: a kayak with a broad waist that offers as much stability as possible. 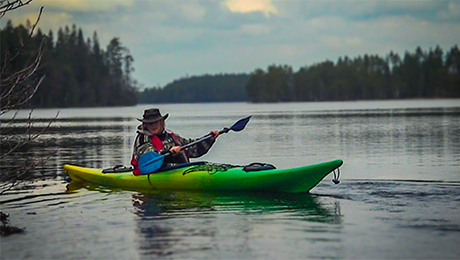 A sea kayak is a kayak that everyone can paddle without previous experience, and the kayak is at least as stable as the traditional canoe (the Canadian canoe). 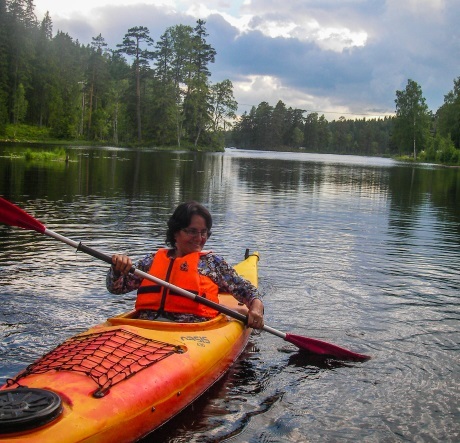 Nordic Discovery's personal service includes assistance with getting into the kayaks and basic instructions upon request. 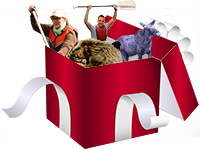 The Kayak Center is strategically located in the middle of the wilderness, in a big Nature Reserve between two nice canoe trails. The Kayak Station is open daily 09:00 AM - 07:00 PM from 1 May - 30 September. Which is more fun to paddle: canoe or sea kayak? Doubtless: The sea kayak. 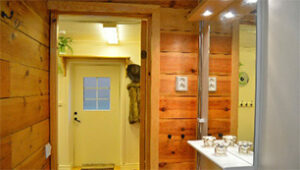 The sea kayaks have added a new, exciting dimension to outdoor life.